Innova scan tools are among the best on the market today. The company makes a wide range of them, from entry-level devices to high-end ones that cost thousands of dollars. Some are OBD1 compatible while others are for OBD2 vehicles. With such a wide selection, how do you pick the best Innova scan tool for you? To make your work easier, we’ve put together this review of the top 9 products from Innova. It contains both OBD1 and OBD2 code readers. Important side notes if you are new to OBD: OBD is short for onboard diagnostics. It’s a system that vehicles use to diagnose themselves, identify problem areas and report those problems to the user. For you to view diagnostic reports (usually in form of codes) you need a diagnostic tool. Now that’s where OBD scanners come into play. Cars made prior to 1996 are OBD1 compliant while those made from 1996 onward are OBD2 compliant. 1 How Did We Choose The Best Innova Scanner Products? 5.1 What’s the difference between OBD1 and OBD2? 5.2 What is Check Engine Light? 5.5 What is the EVAP system? 5.6 How can I know if an Innova scan tool is compatible with my car? 5.7 Can I use one tool for several cars? How Did We Choose The Best Innova Scanner Products? We tested a variety of Innova scan tools before picking the best from the batch. The 9 scanners that appear on this list performed impressively, and each one earned a spot in the review. Don’t have enough time to read the whole review? Here is a comparison chart that you can skim through. While Innova is generally a reliable brand of OBD scanners, not every Innova scan tool offers the same functionality. So which one will meet your needs? Here’s our recommendation section to ease you into the product reviews. The INNOVA GM Code Reader accesses the vehicle’s on-board computer to retrieve engine and electronic transmission codes and ABS vehicle computer codes. The 3123 is one of Innova’s premier diagnostic tools for OBD1 cars. 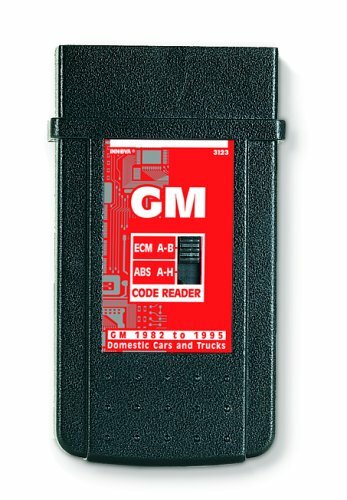 Designed specifically for the GM brand of vehicles, this device reads engine (ECM) and ABS codes. By pulling ECM codes, this Innova scan tool will tell you why your Check Engine Light is on. You can, therefore, reset the light by fixing the issue. Being an OBD1 scanner, the Innova 3123 is not exactly your high tech scan tool. Besides numeric codes, it also gives DTCs by flashing the engine light a certain number of times depending on the nature of the problem. You need to be keen to count the flashes accurately and interpret them correctly. Luckily the package includes a user guide with code definitions. With a bit of effort and reading, you will be able to locate an engine or ABS-related problem. INNOVA 3123 works on most General Motors domestic cars and trucks from 1982 to 1995. The Innova 3123 is a GM scan tool that works on domestic cars made between 1982 and 1995. Those are basically OBD1 GM cars. If yours was made after 1995 then it’s an OBD2 model and that means it’s not covered by this Innova scanner. The simplicity and low cost of this Innova code reader make it perfect for the ordinary car owner. 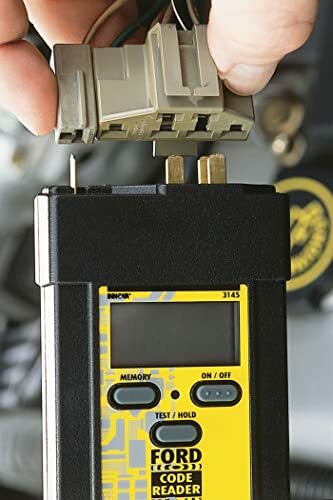 If you own a GM car and don’t want to spend hundreds of bucks to get your engine or ABS codes from a shop then it makes perfect sense to buy this device. The Innova 3145 allows you to access the onboard computer on your Ford car and pull engine codes. It’s an entry-level Innova code reader, so as expected it doesn’t cover much beyond the ECM. That said, it does read and clear engine DTCs, and in doing so allows you to reset the Check Engine Light. The DTCs come as numeric codes, so you won’t face the trouble of having to count flashes. Perhaps the best thing about this Innova scan tool is its ability to store codes. It has an inbuilt memory that stores codes after you’ve unplugged the device. That means you can still review the diagnostic data even when the scanner is not connected to your car. Like the Innova 3123 above, this particular code reader works on OBD1 cars. The difference is while the 3123 is designed for GM vehicles the 3145 covers the Ford brand of cars. You can use it on domestic Fords, Lincolns and Mercury’s manufactured between 1982 and 1995. Innova 3145 with Easy-to-view digital display shows numeric trouble codes and eliminates the need to count flashes. The Innova 3145 is arguably the best Ford scan tool for OBD1 cars due to its simplicity. You don’t need expert knowledge to find your way around it. In case you need help, it comes with a manual that has a ‘how to’ guide and code definitions. That’s what makes it great for ordinary car owners. 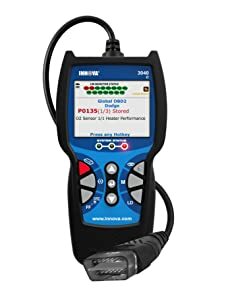 INNOVA 3120 is designed to retrieve diagnostic codes in all OBD2 (1996 and newer) and some of the most popular OBD1 (1981 to 1995) vehicles this item features unique patented all-in-one screen display and LED display for quick emissions check. Unlike our first two Innova scan tools that only work on OBD1 cars, the Innova 3120 covers both OBD1 and OBD2. 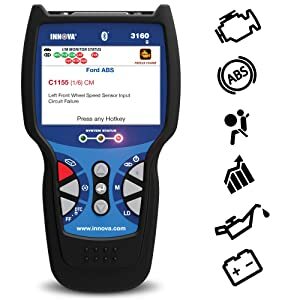 This mid-range diagnostic tool offers a good balance between performance, vehicle compatibility and price. 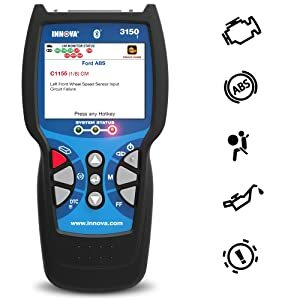 In addition to reading and clearing engine and transmission codes for OBD1 and OBD2 cars, this scanner also supports ABS diagnostics for OBD2 vehicles. So besides using it to reset the Check Engine Light, you can rely on it to tell you what’s wrong with your OBD2 ABS or OBD1/OBD2 transmission. The 2.8-inch color screen displays 20 pieces of data at a go. That includes codes and their definitions to help you understand what each one means. During repair, the Innova 3120 automatically refreshes after every 30 seconds to show problems that have been fixed. Be warned though; while Innova advertises that this scan tool supports both KOEO (key on engine off test) and KOER (key on engine running test), you may have a problem doing KOER tests on OBD1 cars. 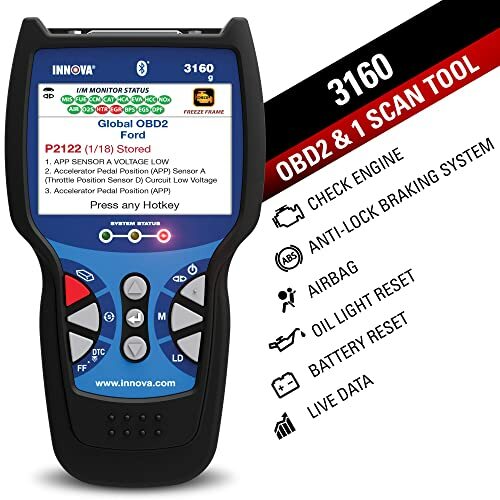 Innova 3120 diagnoses and erases OBD2 / ABS codes on most popular, newer-model vehicles. As far as ECM checks and resetting the Check Engine Light, the Innova 3120 works on all mainstream OBD2 cars sold in the USA. That includes cars, SUVs and light trucks made from 1996 onward. It also does the same for a wide selection of OBD1 cars. First, it covers GMs made from 1982 to 1995. Secondly, the scanner works on Ford, Lincoln and Mercury cars that have EEC-IV systems. Those are basically Fords, Lincolns and Mercury’s that were manufactured between 1983 and 1995. Thirdly, this Innova scanner is compatible with Toyota and Lexus models made between 1991 and 1995. It also covers Jeeps that were manufactured from 1993 to 1995. Finally, you can use it on a Chrysler, Plymouth and Dodge vehicle that was made from 1984 to 1995. As far as ABS diagnostics, the Innova 3120 covers 1996 and newer (basically OBD2 compliant) cars that fall in the Ford, GM or Chrysler brands. The fact that this Innova scan tool neither supports advanced nor full system diagnostics means it just falls short for professional use. But if you are a beginner mechanic or DIY enthusiast it covers enough vehicles and offers adequate functionality. Innova 3040e makes up for some of the shortcomings of the 3120 above. For instance, it can generate live graphical data as well as reset the oil light. You can also use the scanner to do battery and alternator tests. Live data is particularly essential because it enables you to view real-time diagnostic reports. As such, you can see the issues that have been fixed and those that are still pending during the repair process. This is a great feature for all but especially for DIYers and mechanics. Innova 3040e views Live Data in real time for more accurate troubleshooting and diagnosis. On matters diagnostics, this Innova scan tool can read and clear engine and ABS trouble codes. So if you are looking to reset the Check Engine Light then this device makes for a good option. The same goes for the ABS warning light. The Innova 3040e works on most domestic and foreign OBD2 vehicles. More specifically, it covers cars, SUVs, hybrids and light trucks made from 1996 to date. That said, there are a few issues about the scanner missing some codes on certain makes and models of vehicles. For example, it might not be able to pull ABS codes on Honda, Toyota and several other Asian-made cars. But if your car is American-made you shouldn’t have such issues. Still, on matters compatibility, the Innova 3040e supports PC connectivity. You have to hook it to your computer in order to update its software. It, however, doesn’t work on Mac systems. The range of functions makes this Innova scanner ideal for DIYers. It doesn’t offer advanced functions that a professional needs. But for a DIY person, the functionality is more than enough to prove a vehicle’s ECM successfully. 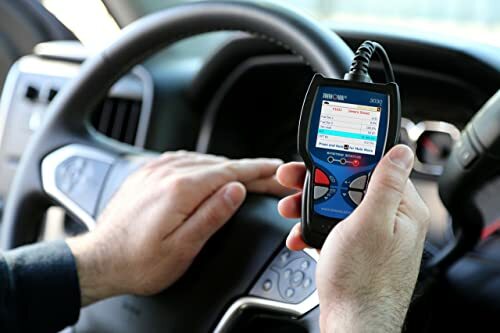 An affordable and durable entry-level tool for diagnosing Check Engine Light problems, checking road trip readiness, inspecting used cars and more. No automotive experience needed! The Innova 3020 and Innova 3040e are similar in a few ways. For starters, both can perform ECM and ABS diagnostics. It follows that the 3020 can also reset the Check Engine Light as well as the ABS warning light. Just like the 3040e, this Innova code reader can display up to 25 pieces of information on the screen. It also offers live data, but you don’t get graphical PIDs with this one. However, its ability to refresh after every 30 seconds means you get real-time diagnostic reports. The benefit of that is that you will instantly know if a problem has been fixed during repair. The one feature that gives the Innova 3020 an edge over the 3040e is its capacity to run smog test. Built with red, yellow and green LEDs, this device uses color coding to show the status of your emissions monitor. A red LED means there’s an urgent problem with your emissions system. A yellow means there’s a possible problem while a green one means everything is okay. Simple as it is, this test will help you know whether your car will pass state and federal emission checks. This Innova scan tool is designed to cover domestic and foreign OBD2 vehicles. It should work on cars, SUVs, light trucks and hybrids. However, like the 3040e above, the ABS check function doesn’t always work on all vehicles. That’s despite Innova’s claim that it checks ABS on ALL OBD2 vehicles. In fact, there are several complaints about some of the most mainstream brands like Honda, Toyota, GM and Ford. Unfortunately, there’s no way to predetermine whether the ABS diagnostic function will work on your car. It might not be good for a professional mechanic but the Innova 3020 can be a lifesaver for a DIYer or ordinary car owner. It not only checks a car’s engine system but also scans ABS and runs emission tests. That’s what most DIYers and car owners need most. The all-new 3100j is the perfect entry-level tool designed to empower any consumer or technician when it comes to vehicle maintenance and repair. 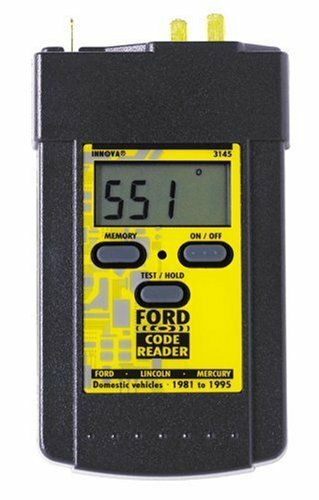 This code reader works on all 1996 and newer OBD2 cars, light trucks, SUV’s, hybrids, and minivans. Refer page 34 in the user manual for troubleshooting steps. 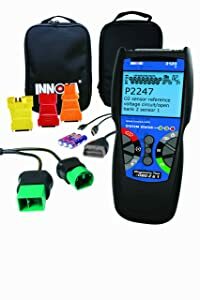 Capable of checking the engine, SRS and ABS for errors, this Innova scanner is an entry-level tool that brings quite a lot to the table. First off it can read and erase ECM, SRS and ABS codes. As such, the scanner can reset the Check Engine Light as well as SRS and ABS warning lights. Something to note: if your car is not a US-based brand you might only be able to check the engine but not SRS and ABS. That’s a bummer for people who own EU and Asian-made cars. Secondly, the Innova 3100j supports oil reset. The best part about this function is that you get a step by step guide on how to do it. You don’t need to be savvy with cars to perform this function. Additionally, this Innova code reader performs emissions readiness tests. Basically, it checks the EVAP system and reports whether your car will pass a smog test. Something else to note is that it actually feeds the user with a lot of helpful information. You can view freeze frame data of several parameters, including battery status, engine coolant temp and fuel supply. According to Innova, the 3100j should work on any 1996 or newer car. That’s to say it is designed for OBD2 compliant vehicles that include cars, SUVs, hybrids and light trucks. While that’s the case for US-made cars, it doesn’t support ABS and SRS diagnostics on many EU and Asian brands. Innova 3100j quickly reveals the cause of “Check Engine” light warnings on any 1996 and newer OBD2 car, light truck, SUV and hybrids. Still, on the issue of compatibility, this Innova scan tool can hook to a PC and print diagnostic data. But it only works on Windows computers, not Macs. If you are a professional mechanic who knows codes off the top of your head you won’t need to check online for code definitions. However, you will find the Innova 3100j largely lacking because it doesn’t support advanced diagnostics. Not even transmission system scans. That’s why it’s ideal for DIYers and beginner mechanics. If you are just starting off it offers enough to give you a hang of diagnostics. An advanced tool for the professional Tech, yet user-friendly for the DIYer. 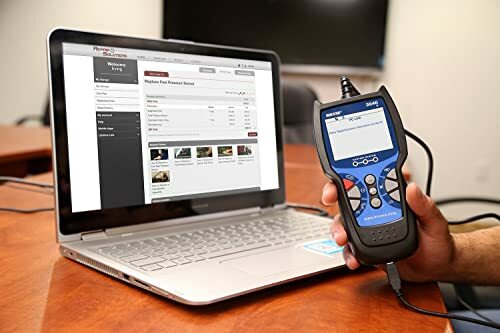 The 3160 scan tool is a great choice for anyone looking to stream & record live data, diagnose check engine, ABS and SRS lights, reset oil & battery maintenance lights, or initialize batteries. The Innova 3160g scan tool can diagnose and reset the Check Engine Light. In addition to that, it can pull and clear ABS and SRS codes. Plus it supports emission readiness tests. So as far as basic OBD2 diagnostics, the only thing you won’t be able to do is to check the transmission system. Regardless, it does offer some additional features that may be handy. For example, it can reset the oil light and battery maintenance light. Compared to the scanners we’ve covered so far, this Innova scan tool offers the best data stream. With a 3.5-inch screen, it doesn’t just display real-time numeric data but can also show live graphs. You can record your diagnostic data and analyze it later. Alternatively, you can connect the scanner to a PC and download it there for further analysis. While the Innova 3160g is generally compatible with OBD2 cars, the range of functions that you will get depends on where your car was manufactured. You can read and erase engine codes (reset the CEL) on any 1996 or newer car, domestic or foreign. That includes cars, SUVs, light trucks and hybrids. Innova 3160g can work as OBD1&2 scan tool. However, when it comes to ABS and SRS diagnostics, the device doesn’t always work on foreign cars. There are several complaints regarding compatibility issues with Jeeps, Toyotas, Hondas and many other EU or Asian-made brands. You might want to check the Innova website to confirm whether your car is fully supported. The compatibility issues of the Innova 3160g are a letdown. However, if you find that it is fully compatible with your car then you will love its functionality. This is a typical scanner for DIYers and beginner auto technicians. 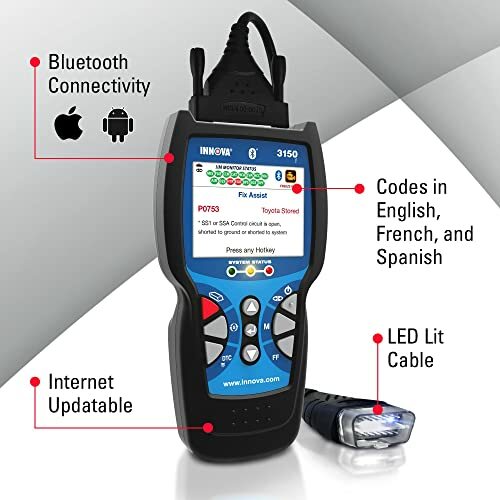 The 3150 code reader is the ideal tool for professional and DIYers alike looking to retrieve Check Engine Light codes, while having advanced features such as ABS, SRS, Oil Light Reset, Battery Initialization, and Battery Light Reset. The Innova 3150f is capable of reading and resetting ECM, ABS and SRS codes. By resetting engine (ECM) codes this Innova scanner allows you to turn off the Check Engine Light. Similarly, when you reset ABS and SRS trouble codes you will be able to turn off their respective warning lights. In addition to pulling and deleting codes, the 3150fcan perform battery maintenance and oil service resets. Basically, it’s a reliable device for getting rid of nagging warning lights. But you will have to rely on online resources to interpret codes. Its guide and the built-in code definitions are far from dependable. Beyond that, you can use it to run smog tests. 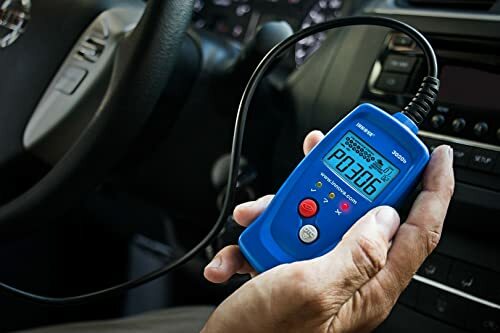 With its ability to probe the EVAP system, this Innova code reader will tell you whether your car meets state and federal emission standards. This device is meant to perform diagnostics on OBD2 cars, both domestic and foreign. For the most part, it does that, particularly in ECM diagnostics and emission tests. However, like most other entry-level scanners from Innova, the 3150f is mainly targeted for US-made cars. Innova 3150 features with wireless connectivity. It should come as no surprise that not all functions work on some of the most mainstream EU and Asian cars. For example, ABS and SRS diagnostics don’t always work on some Jeep, Honda, Toyota, Benz and BMW models. Despite the two drawbacks, the Innova 3150f is not a bad scanner at all. It is great for car owners and DIY enthusiasts who may want to do a few repairs here and there. The live data provided helps a great deal with that. 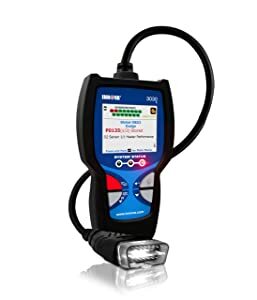 Diagnosing Check Engine lights is now even easier, with the affordability and simplicity of the Innova 3030h. Verify your car’s emissions test status, check road trip readiness, and many more features. The Innova 3030h is as basic as a code reader can get. It offers two of the most essential diagnostic functions. First, it reads and erases DTCs related to the Check Engine Light. Those are basically ECM codes that usually trigger the Check Engine Light. In doing so it allows you to turn the light off. When the red one comes on it means your car’s EVAP system needs immediate attention. A yellow LED means there MIGHT be a problem while a green one indicates that your car’s EVAP is in perfect condition. It’s that straightforward. Basic as it is, the Innova 3030h does offer a wide range of helpful data. For one it shows freeze frame data for various parameters like engine coolant temp, battery and fuel supply. It also notifies you when a critical DTC pops up so that you act on it with urgency. More importantly to the DIY people, this Innova scan tool refreshes data after every 30 seconds. That slows you to identify problems that have been fixed and those that are still pending. This Innova code reader is for OBD2-compliant cars. It covers domestic as well as foreign vehicles that have the 16-pin OBD2 port. That goes for cars, SUVs, light trucks and hybrids. Innova 3030h automatically refreshes data every 30 seconds when connected to the vehicle. It does work as advertised when reading codes. The problem comes when you want to erase a code on a foreign car. On average it will probably clear less than 75% of all the codes on a European or Asian car. The Innova 3030h is for the ordinary car owner. As long as you are not trying to do any major repairs it will offer just enough for you to maintain your engine and EVAP systems. What’s the difference between OBD1 and OBD2? The OBD1 system was used until 1995 after which the OBD2 system was introduced in 1996. Both have the same underlying principles but vary in functionality. Where is the OBD port in my car? Most cars have the OBD port under the dashboard, just below the steering wheel. However, some have it under the gearbox, just above the pedals or in the passenger compartment. It largely depends on the type of car. It is a warning light that indicates a malfunction in the engine control unit (ECU) or engine control module (ECM). Anti-lock braking system prevents a vehicle’s wheels from locking up when you brake. It’s essential to a car’s control and safety. The supplemental restraint system is basically a system that controls the airbag(s). What is the EVAP system? The evaporative emission control system prevents gas from leaking and escaping into the atmosphere. Essentially it ensures minimum pollution if any. How can I know if an Innova scan tool is compatible with my car? In addition to checking our reviews above, visit Innova’s website and search for the tool you are interested in. Check whether your car is listed among those covered by that scanner. Can I use one tool for several cars? Yes, provided all the cars are compatible with the device.